Our bodies require about 40 different essential nutrients and around 2,000 calories per day (depending on age and physical condition). People who want to eat healthier diets should try to add greater variety to their meals. Most American families only eat from about ten recipes and most of those are too rich. American cheese (highly processed) is classified as dairy but in reality it is three quarters fat and one quarter protein. An egg contains twice as much fat as protein, approximately 65% fat, 32% protein, and 3% carbohydrate. Foods don’t contain only one nutrient. Sensible eating requires that we know what’s really in each kind of food and plan our meals around that – not what “fits” into food groups. Protein, carbohydrate, and fat are known as macronutrients. Vitamins, minerals and trace elements are micronutrients. Non-nutritive components are fiber, water, and a multitude of chemicals in plants and animals, some of which have yet to be identified. Nearly all foods contain a combination of two or three of the macronutrients with the exception of highly processed and refined foods. Protein should be about 15% of your total calories. Generally, American’s eat 50 to 100% more protein than their bodies can use. Many foods besides meat are rich in protein – dairy products, beans, whole grains and other plant foods. Meat actually ranks about in the middle of the protein quantity scale. Fish, poultry, and dairy products provide higher percentages of protein per ounce than meat and eggs. Carbohydrates should form about 55-60% of your diet. Carbohydrates are turned into glucose, your body’s chief source of energy. If it is not used right away it is stored as glycogen. 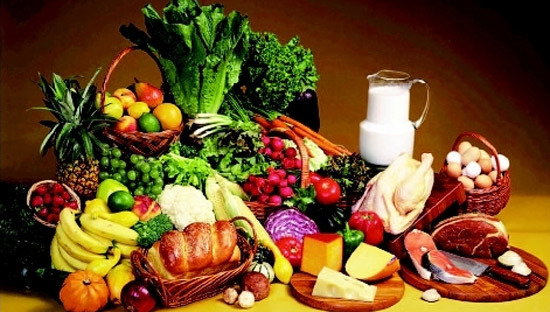 Simple carbohydrates are found in fruits, some vegetables, honey, molasses, etc. These also include vitamins and minerals. Complex carbohydrates are in beans, whole grains, and vegetables. These are also high in fiber. Complex carbohydrates should comprise about 80% of your carbohydrates in your diet. If you switch to a diet high in fiber and low in fats by incorporating plenty of fruits and vegetables, whole grains and legumes, you will have no need to count calories. Losing body fat is a side effect of good nutrition. And, if you adhere to a diet of variety, moderation and balance, your diet will provide you with all the nutrients needed for life and health.